Roffey captain Matt Davies says he wants to see his side retain the Gray-Nicolls T20 Cup this year, after progressing to the quarter-finals. The holders secured comprehensive ten-wicket victory over two-division lower Stirlands on Sunday as they chased their opponents’ score down in just 6.4 overs. Hosts Stirlands won the toss and elected to bat and were restricted to a score of 100-6 in their 20 overs, with Jamaine Bullen (31) top scoring. Roffey, who have started the season in scintillating former then eased to home with 105 without loss inside of seven overs. 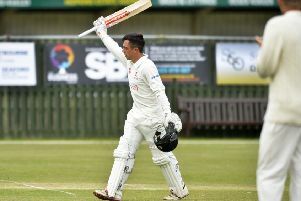 Ben Manenti (98 not out) starred for the visitors and fellow batsman Davies praised his display, but stressed that the win was always inevitable against the lower league side. He said: “Yeah we beat Stirlands away very convincingly. We knew we needed to be on our game but when you play a side two leagues below you, you expect to come out with a win and we did that in a convincing manner. Having won the competition last year, Davies is looking for more glory in the T20 Cup, but he is expecting a tougher test in the final stages. They travel to Preston Nomads in the next round on Sunday, July 1.